It’s time to put down those pencils as 2D event diagramming is quickly becoming a quaint relic of the past. Online event planning is where it’s at and where it will continue to be! AllSeated is constantly developing new online event planning tools and new features specifically designed to drive business growth and ROI for our loyal user community. Along with our obsessively dedicated customer service, AllSeated is focused on bringing the event community the most value possible at all times. Through the use of our collaborative online event planning tools, we save you time and simplify the tasks on your list process. Planning an event should always begin with your guest list. This is no exception when online event planning! 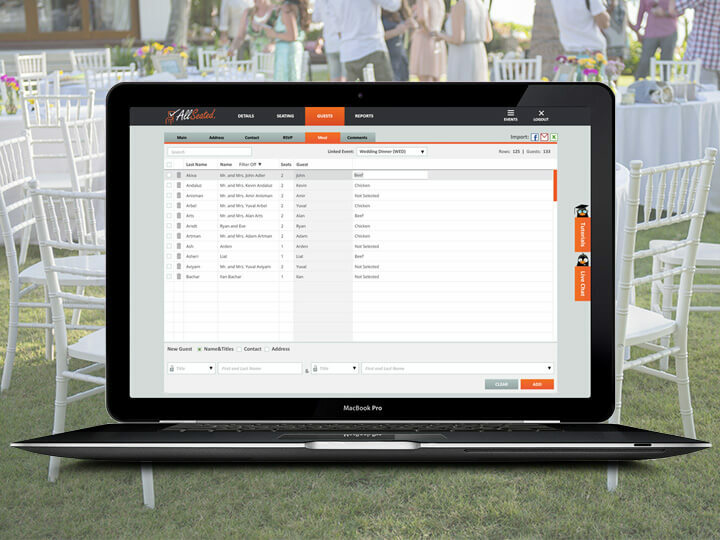 Using AllSeated’s state-of-the-art guest list features, easily organize an event guest list. Guest information can be stored alphabetically or filtered into categories for even more organization. Keep notes, enter meal type information and track RSVP’s all within your guest list. 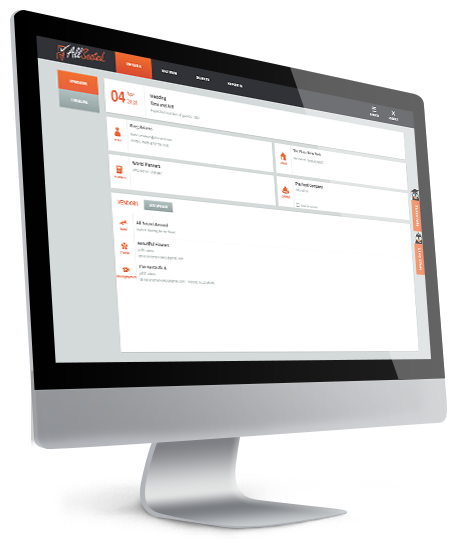 You will also have the ability to track guests and run reports in real time. Online event planning within AllSeated allows you to easily design floorplans to scale.Today, one in every ten events in America is created in AllSeated! For this reason, it’s no surprise that most venues already have their floorplans uploaded to-scale in AllSeated’s platform. If you cannot locate the floorplan for your venue within AllSeated, no worries! You can provide us with a floorplan marked with at least one accurate dimension and our team will scale and upload it into the platform for you. Choose from a wide variety of table shapes, sizes and styles available from the vast furniture library to create the layout you desire. Efficiently customize your floorplan and adjust the spacing between tables as well as the number of chairs around each table. List notes within your diagram if needed and make changes with just a simple click of a button. AllSeated’s guest list features a direct link to seating which allows you access to easily seat guests at the tables that are positioned in the floorplan. Simply select a guest from your guest list, and then click the table in your floorplan at which you want the guest to sit. It’s that simple! You always have the additional option of seating guests at specific seats at each table, if desired. AllSeated now offers designer tools which allow you to build to-scale tabletop and buffet displays within your floorplans. There’s no more guesswork as AllSeated’s designer tools will show you exactly what can fit to-scale on a tabletop. The table builder and buffet designer tools currently have options for place settings, flowers, centerpieces, linens, and buffet pieces, with many more objects to come. AllSeated’s online event planning allows you to view your floorplans and seating in 3D!Easily switch from 2D viewing to 3D viewing at any time during your process. AllSeated’s amazing 3D tools can be set to “Bird’s Eye View” which allows you to see your floorplan layout from above. Alternatively, you can walk through the space in 3D as if you were actually moving through your event in 1st Person View. Taking a virtual walkthrough of your floorplan in 3D helps to ensure that you’re 100% satisfied with the layout before the day of your event. Where can you find the event market’s first, only, and truly game-changing virtual-reality capability? Only at AllSeated! 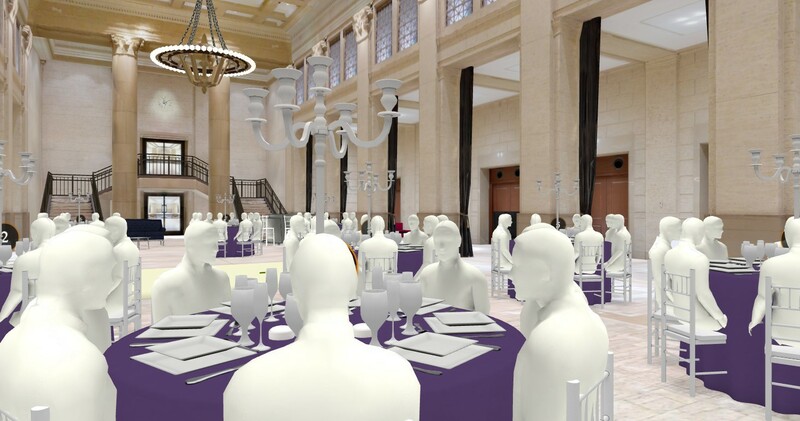 AllSeated’s special virtual reality goggles allow you to walk and tour the floorplan layout of an event in a realistic simulation. Learn more about AllSeated’s Virtual Reality and the three easy steps for getting started here. Online event planning allows you the option to generate reports. Using the filters, easily select the types of reports you wish to create. A floorplan report can detail your specific layout along with complete listing of inventory, table breakdown and seating information. A guest report can also created including details like meal types, table numbers and notes that relevant for the venue/caterer. Create a guest list report to provide for invitations, place card creations and personalized event favors. Online event planning provides the easiest and most effective way to collaborate with others throughout the planning process. In addition to being able to invite your client and vendors to assist with tasks, you also have the opportunity to collaborate within timelines. Vendor collaboration is key and working within a vendor timeline, which is updated in real time, will help to keep everyone working your event up to date on all details. A timeline also helps to convey the flow of set up, event details and the timing of break down at the end of an event.